Aluminium Jon boats are mainly used as shallow draft workboat and fast response boats. These boats have a flat bottom and shallow draft and they can be used in all water areas. Due to the shape of the jon boat these boats are very stabil. 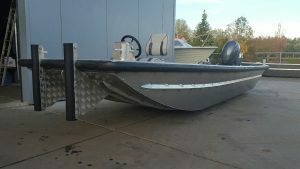 The flat bottom boat has a shallow draft and is very easy to maintain. 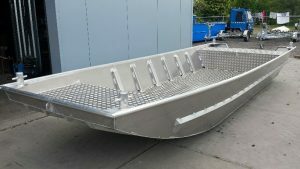 Aluminium jon boats are available in all sizes from 5 to 15 meter. All aluminium flat bottom boats are reinforced on the sides and bottom. 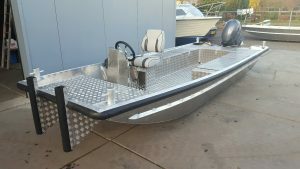 The shallow draft aluminium jon boat is made from aluminium all with the highest quality available.In regards to transport this flat bottom boat can be transported on all kinds of trailers. 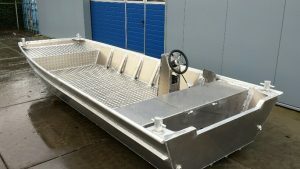 All aluminiumjon boats have a self drained deck and a non slip floor and will keep their value for years. The hull of a jon boat is nearly flat, therefore it tends to ride over the waves rather than cut through them. Jon boats typically have a transom onto which an outboard engine can be mounted. They are simple and easy to maintain, and inexpensive with many options to upgrade. We can also help you with building a landing craft.